Finally, after months of anticipation, on December 16, 2015 the Federal Reserve Open Market Committee raised the target overnight lending rate from 0.0% to 0.25% – where it has been for nearly a decade – to 0.25% to 0.50%. And how do the markets react? With an abundance of holiday cheer in the stock market – Dow Jones Industrial Average up 225 points – and a mere nod of the head in the bond market. What gives? Why does the stock market care about short-term interest rates while the bond market has no comment? Aren’t bond prices supposed to fall when interest rates go up? The answer: the interest rate increase was ‘already priced in to the market’. Source: www.treasury.gov. Yield change in U.S. Treasury bonds from December 15, 2015 to December 16, 2015, when the Fed announced the increase in the Fed Funds target. OK, but what does ‘priced in’ really mean? Before investors buy stocks or bonds, they need to forecast the future profits of a company (stocks), or the future level of interest rates (bonds). Once an investor has bought a (fixed rate) bond, his interest rate is set for the life of the investment. 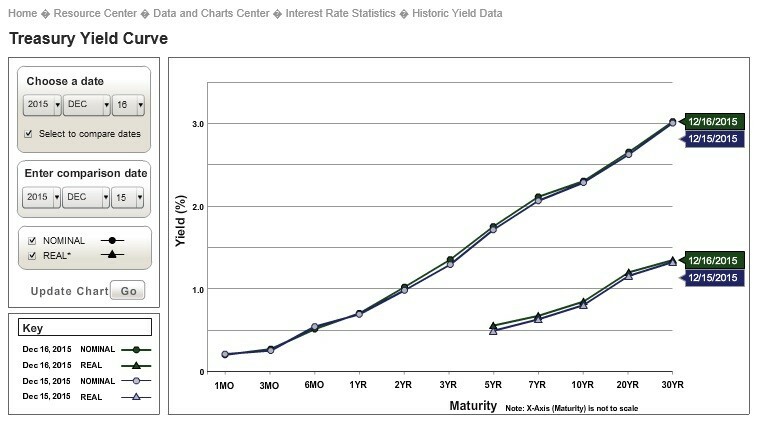 If the market level of interest rates goes up after his investment is locked in, the value of his bond will fall in value in order to compete with newer bonds issued at higher rates. When Fed Chairman Yellen told investors the FOMC was poised to raise interest rates, bond investors immediately changed their forecast to expect higher future rates, causing yields to rise and bond prices to fall. This effect happens before the Fed actually does anything, hence the rate increase is ‘priced in’, or already reflected in current market prices. However, if we compare interest rates from December 2014, when the strength of the U.S. economy was still in question, we see a different picture. Source: www.treasury.gov. Yield change in U.S. Treasury bonds from December 1, 2014 to December 16, 2015, when the Fed announced the increase in the Fed Funds target. The change in short-term interest rates was clearly foreseen by bond investors as the Fed became more clear about their intention to raise the Fed Funds rate target. 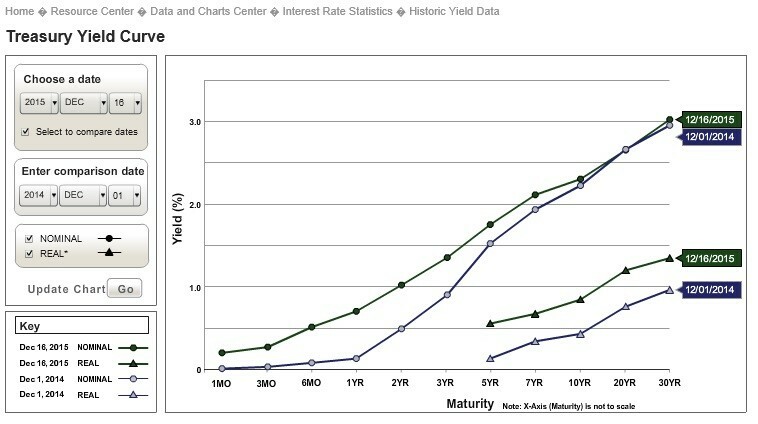 But apparently the same investors don’t expect longer term rates to rise much at all. That’s because longer term rates tend to react most to inflation fears, of which we have none at present. Once the economy really heats up, look for long term rates to start trending higher. Ok, we can understand why the bond market had no reaction to the Fed’s announcement. But why did the stock market react so positively? Because the Fed has been waiting for evidence that the fragile economic recovery could withstand taking their foot off the monetary policy accelerator. With that confirmation finally in hand, stock investors appeared willing to pay higher prices in anticipation of potential increasing corporate profits in the coming months. Unfortunately, the stock market gave back all those gains the very next day. Perhaps stock investors are not so optimistic after all. The Fed is walking a narrow line between avoiding asset price ‘bubbles’ and stifling the economic recovery. It remains to be seen whether the Fed can keep its balance over the coming months.